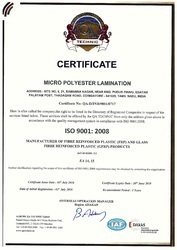 Established in the year 1994, at Coimbatore, Tamil Nadu (India) our company “Micro Polyester Lamination” is engaged in Manufacturing, Supplying and trading optimal quality FRP Tank and Pipes. We provide wide range of FRP Chemical Pipe, FRP Storage Tanks and FRP Solar Tank Covers. As, we are able to understand the diverse requirements of our customers, we provide them qualitative product range according to their demands. Our product range is being extensively appreciated and demanded by our customers owing to their superlative quality and long term durability The Company has proven their endurance, diligence and efficiency in various industries through delivering flawless quality, exceptional values, on time services etc. All our products are flawlessly finished and tested over several quality measures for further use so that they can last longer and superior performance when used. We are supported with a team of highly experienced personnel’s who help us in offering qualitative range of goods to our clients. They are our great strength and are always ready to face challenges for the growth of the company to maintain the company’s position in the market. They are full with confidence and effectively use it while making deal with our clients. They also provide effective solutions for our problems and are capable to accomplish assignments in a specific time period. They are truly loyal to their work and organize regular meets that help the leaders to manage quality of the products. We have become prominent organization of this industry, because we never compromise with the product quality since our inception. Our products are free from adulteration and well processed in our manufacturing unit. They are highly effective and reliable for usage. Provided with requisite machinery and tools as well as a team of professionals, our production facility enables us to manufacture superior products in most effective cost. To keep our operations smooth and flawless, we regularly upgrade our production techniques by using modern machines as per the international trends. We are looking enquiry from "Coimbatore, Tamil Nadu, Kerala" only. Our entire operations are conducted under the supervision of Mr. Mahesh. Being the Proprietor of the company, he provides his necessary guidance for the well being of the organization whenever necessary. He always maintain his professional behavior while making deals with our valuable clients which helps in increases the satisfaction level of our clients that they are at the right place. He conducts training session for the company employees on regular basis. Manufacturing and Trading of FRP Tank and Pipe. We, being a very quality conscious organization, ensure that we implement and adhere to stringent quality control measures as per the international standards. Each and every stage, starting from the procurement of the raw materials till the last stage of production is carefully monitored under the supervision of our quality experts. The raw materials like steel, aluminum and stainless steel are acquired from the most reliable vendors in the market and are cross checked thoroughly before being used in the manufacturing process.